It's fun to cross the Brooklyn Bridge -- but for many people, once is enough! Where in New York City can you rent a bike and ride across the Brooklyn Bridge, explore a bit of Brooklyn, and get back to Manhattan without adding the extra mileage? You can rent a bike from many bike shops in Brooklyn. Or go the DIY route, which is cheaper and also easy. Just rent a Citi Bike, ride to your heart's content, and then just return the bike and hop on the NYC Ferry. The only risk is that you won't be able to find or return the bikes exactly where or when you wish. So, if you have a plane or Broadway show to make, leave plenty of time. Find out where you can pick up or return Citi Bikes near the Brooklyn Bridge. A Citi Bike day pass costs twelve dollars. Just to note, you can only have access to the bike for thirty minutes at a time. After thirty minutes, you must return the bike to a Citi Bike station. If you ride for longer than thirty minutes, it's four dollars for each additional fifteen minutes. If you'd rather take a bike tour, get in touch with Bike and Roll which also offers a Brooklyn Bridge Bike Tour. They also have a bike rental location in lower Manhattan, if you'd like to rent a bike from them for the day. 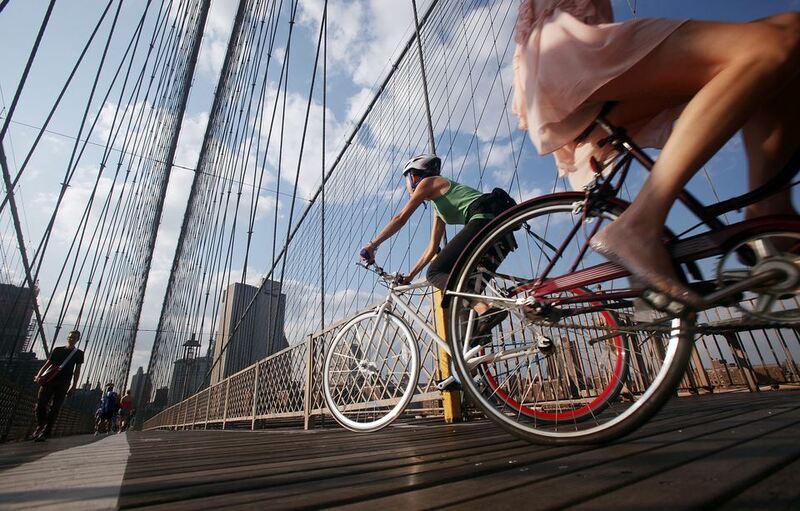 If you do rent a bike or are traveling with a bike, you should allot time to cycle around Brooklyn Bridge Park. If you want to use a Citi Bike, you can find a list of stations here. There are numerous cycling paths in the park and place to take a break after a refreshing scenic cycle. The park is a great place to cycle for those who want to exercise, but don't want the stress of trying to navigate cycling on New York City streets. Taking the ferry to and from Brooklyn is a breathtaking way to enter or exit the area. Feel the breeze as you soak in the sights on a ferry ride. The NYC Ferry has a route that runs from South Brooklyn to Pier 11 in Wall Street. A ride on the NYC Ferry is $2.75, which is the same as a ride on the subway. If you are bringing a bike along (unless you have a folding bike) there's a $1 surcharge. You must select the bike option when purchasing a ticket. Another option is the New York Water Taxi, where you can purchase an all-day access pass for $37 for adults and $31 for kids, and take this sightseeing cruise to various stops around the city including Battery Park, 42nd Street and Dumbo.